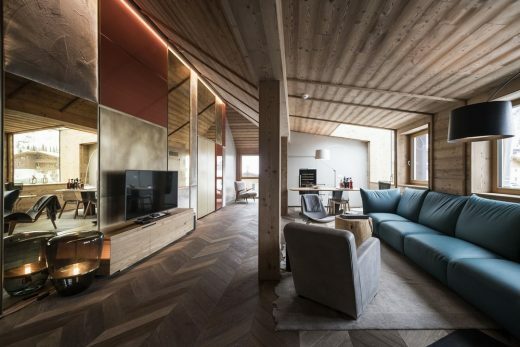 The new hotel extension is divided into two smaller volumes that form an arena oriented to the Southern Valley and opens up to the close rock massif of the nearby Schlern Mountain. The contrast between the wideness of Bolzano’s basin and the imposing presence of the Schlern Mountain is brought back into both fragments of the building in order to create a formal and functional dialogue. At the same time the view, the panorama and the mountain silhouette remain the main focal point. The hotel achieves a significant attribute to its new identity through the establishment of the new wellness area; the element of water becomes integrative part of the concept of architecture, interior design as well as all products and furniture. The natural stone cladding and wooden frames get reflected inside the full height glass elements and sink into pool, lake and seascape. Inspiration for the form-finding of the façade has been drawn from local building traditions of Kastelruth such as the “Heuharpfen”, the Futterhaus, the double-paired farm (Paarhof) and the ancient wooden fences. The irregular wooden frameworks abut with different lengths into the surrounding landscape and enclose it. As a consequence, spaces that stand between internal (earth) and external (landscape) are created and become part of the landscape. The rhythm of melting two spaces shall evoke the feeling of security in the visitor’s sensation. Room-high glass panels and wide terraces accentuate the interaction of the inside and the outside – of the building and the landscape. Another fascinating element of the exterior and interior design are the typical “Heutücher” – 50 year old linen cloth that communicates warmth and forms the subtle separation of the room’s terraces. Moreover, the connection of several terraces is facilitated by simply removing several rags. The suites are characterized by almost square floor plans; the room-high window panels allow a maximum of natural daylight illuminating all backsides of the rooms and the bathrooms. The bed faces towards the valley and every guest can enjoy the great views right in the morning while waking up. The guest is supposed to feel like sleeping outdoors because of the bed’s position right at the border of exterior and interior space. The lounge area of each room contains a big futon and is completed by the traditional linen cloth; it is made out of fabric that is up to 90 years old and was hand-weaved on a loom from 1901. The wellness area is composed of a main pool area and a sauna area. The pool consists of an indoor element that forms the entrance area and is connected to the outdoor pool of approx. 70 square meters. Sundbeds invite to relax and enjoy the wonderful panorama. The pool is framed by the façade’s wooden work and spans over the entire western wing of the building. The water sloshes over a fifteen-meter long infinity edge, plashing down onto the generous sundeck. A Finnish sauna, a Herbal sauna, a Steam Bath and various relaxation and sleeping rooms complete the eastern part of the building. The Finnish sauna comes with a great 270 degree panorama window. The herbal sauna is located 1.5 meters below the rest of the wellness area, right on the level of the outer natural lake. Entering this lower sauna the guest gets the sensation of a mirrored panoramic view repeating itself within the lake surface. The entire space sits right in the middle of the lake area and the glass surfaces transport the water reflections playful into the inside. Also inside the steam bath, which is the only room without any openings to the outside, the element of water is omni-present. It trickles down an oblique wall and sweeps the light, which comes out of stone cubes, along the wall. The sound of the cascade is calming, captivating, even bewitching. Furniture, Lightning, Interior design, Architecture and landscaping – each element was conceived and designed by noa* with the idea of a holistic design philosophy, produced with a maximum of passion, attention to detail, tradition and local craftsmanship. The most challenging internal feature was the production of a lightning object that reflects the human soul. It was developed in collaboration with a Roman glassblower and a German designer. Single mouth blown glass beads were filled with water and dangle down from the ceiling of the staircase, which is the connection between the new and the old building – the rooms and the wellness area. The different forms of the glass elements come from natural stones that were found in the surrounding areas and were used as negative forms. The lightness of the building contrasts the enormous cliffs of the given landscape and balances the claim for pleasure and inner calmness. 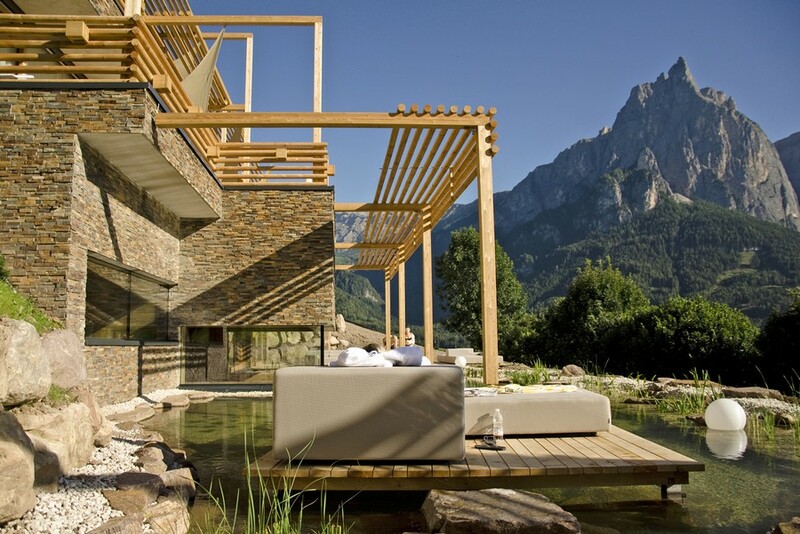 The architecture aims to highlight the silhouette of the mountainous landscape and is softly integrated into the fascinating alpine scenery. noa* exclusively used traditional materials such as natural stone cladding, wood, glass or linen. Crucial aim was the experimentation with traditional working processes in the manufacturing of the materials. Each space of the hotel was tested to reach intriguing compositions by using 3d-and 4d based software. The three dimensional display and visualisation was essential for the composition of surfaces and materials. Different prototypes of wood, tiles, fabrics, carpets and lamps were connected to a holistic assembly of colours and materials. Room-high windows allow the ideal gain of solar energy at this sea level. The wooden façade elements serve as active and passive sun protection. Moreover, obscuring elements were used to avoid overheating and form a stage for the dialogue between nature and building. What is a SPA? What can anyone do there? Guests of a wellness hotel are in search of recreation and relief. A physical equilibrium to recollect after busy work-days. This makes the attendance much more than a simple holiday: it helps to recollect, relax, reinvent. The ambience and all its attributes have a crucial influence on this process. 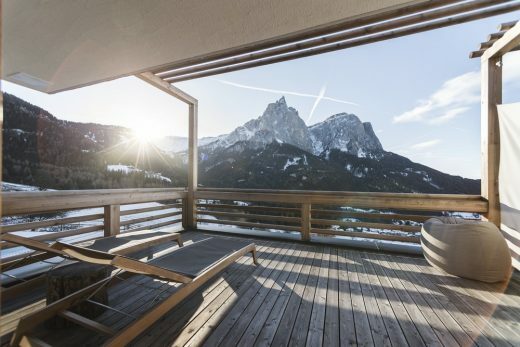 A hotel located in the middle of the italian dolomites, with an impressive landscape and outstanding panoramic views. Iuxtaposed you find the pool with diving basin, refreshment after a hot bath, a natural lake with a swimming raft. The perfect location to hang out, a place full of power and tranquility. Based on such surrounding artefacts, the “soul” is being conceived as a space installation inside the atrium of the new hotel wing right near the entrance to the wellness area. It serves as gateway between old and new, in and out, here and there…as well as an invitation to observe, find out, and enlight the atrium. The installation itself consist of 40 glass elements hanging in a bundled shape from the ceiling above. They are filled with water, they intensify the casting light and perform reflections and refractions onto the inner space. Overall the installation resembles through its lightness and ghostly appearance the concept of a dreamcatcher. Thanks to large window panes forming the building façade, natural sunlight sets the scene for the visual effects of the soul during daytime. The light splits up into a colour spectrum and offers via dispersion rainbow-like aspects and fragments onto wall, floor and ceiling. At night emerging light bulbs replace the sun by implicating similar visual effects. The glass elements are fixed couple-wise on thin cords and are kept in position by aluminium poles with different lenghts. This act of balancing is seen as metaphor for the process of searching the inner balance of the soul. Furthermore this way of fixing the ensemble of the glasses enables an effortless movement of all components which extends onto the water inside the bulbs and consequently on the light-reflections. The particular shape of the glasses is pivotal for the concept of the soul. Originally adapting the shape of a bead (or drop), they include the element water as essential component of any SPA. All parts are mouth-blown and variate in size, shape and weight. Each element is unique. Even more concise is the effect of mouth-blown objects on the form-finding process. All of them where modelled as negatives on large natural rocks, found in the surrounding dolomites. Those rocks are again metaphors for the southtyrolean soul, which can be read as a nature being strongly attached to its impressive landscapes, its tradition, its beauty, its untouched identity. Similar to the human soul, by being raised above the ground the soul-installation is hovering, floating…it remains intangible.